Good Morning - Good Afternoon | A.B.E. Remodeling, INC. It's not funny how time passed by.... All morning I wanted to put out a note here and zoom, it's now afternoon already. Well, we just wanted to give a shout out there to you all. Hopefully, you are getting in the 2015 groove. Be honest here-how many times did ya jot down the old year in these new days of 2015? Since we are having a snowy day here in the Lehigh Valley in this first month of the year I thought the picture would be fitting. 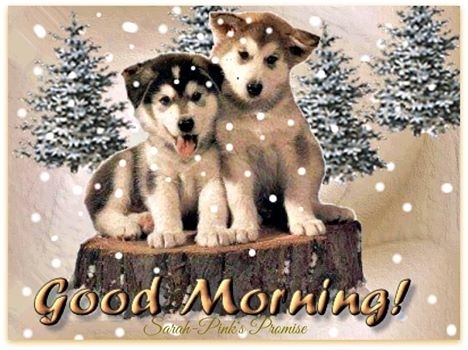 Aren't the doggies so cute and well, the snow is falling. Just remember to be careful in your travels... most likely you are driving cautiously but you just have to keep your eye on those cars/drivers around you and be ready for the unexpected. Well Folks - just wanted to say GOOD MORNING/now GOOD AFTERNOON. Enjoy your day.